Well, I finally found (it would be more accurate to say, was given) a new, permanent home for my my N-Digital track. It now fills every available square foot of what used to be the guest bedroom. Now, the only guests in this room will be slotheads. Anyway, as long as I had to go through the arduous task of moving the track, I thought I would make some improvements and address a few niggling issues that have been tolerated far too long. Below is the new layout. The next photo shows my prior track. Given the space constraint, it was a pretty good layout, providing many hours of competitive racing. And it was actually less than one foot shorter than the new circuit. But it definitely had some line-of-sight problems. And, it occupied one entire end of the living room. But the main thing that I didn't like was having the Pit Lane on the back straight – hard to reach. But there was no other option because that was the only straight long enough to accommodate it. The new layout has a long enough straight in the front to accommodate the Pit Lane. However, this required that the N-Digital console/track be located after the pit exit, otherwise cars exiting the pits would bypass the start/finish (S/F) line and their current lap would not be counted. This could be done but it meant that the console/track (and, therefore, the S/F line) would be the last section going into an R2 turn. Not a good situation in the final lap of a close race. So I wanted my S/F line to be prior to the pit exit. In other words, next to the Pit Lane, not after it. The solution was the N-Digital Multi-Lane Sensor track. This track section is normally used to provide a S/F line in a four (or more) lane layout, but it can also serve the same purpose in the Pit Lane. The two photos below show how the Multi-Lane Sensor track is installed within the Pit Lane as the last track section prior to the pit exit. It's the track section with the yellow cone standing on it. This allows the N-Digital console/track to also be moved back to a position prior to the pit exit, leaving room to slow down before the first R2 curve. Now when a car goes through the Pit Lane it crosses the S/F line and the lap is counted. Note that the Multi-Lane Sensor has a data cable just like the Pit Lane that must be connected to the N-Digital console. This will require the NINCO #40306 N-Digital Multi Connector Jack to accommodate both cables. Important note: Obviously, only one lane (i.e., the left lane) of the Multi-Lane Sensor track is connected to the Pit Lane. After connecting the Multi-Lane Sensor as shown in the above photos and plugging its data cable into the N-Digital console, to my dismay laps were not being counted for cars passing through the Pit Lane. After some short but futile troubleshooting I removed the electronics cover on the underside of the track piece and discovered that the electronics (PCB) receives power from the rails of the right hand lane – the one that is not connected! The solution was to solder two short jumper wires to connect the respective rails of both lanes. Replaced the cover and problem solved. A well documented nuisance of the N-Digital lane change (LC) track sections is the gap that exists in the plastic slot liner where the tip of the flipper contacts the side of the slot. The gap is intended to allow full left/right movement of the flipper during a lane change. An unintended consequence of this gap occurs when a car's guide flag collides head on with the trailing edge of the liner gap – not a pleasant experience. Over the last few years several solutions to this problem have emerged, incdluding using a strip of tape to cover the gap or creating a bulge in the slot wall to deflect the guide flag away from the gap. They worked well enough but were not perfect or particularly elegant. Recently a very novel solution to this problem was documented by Maurizio Ferrari of Slot.it. 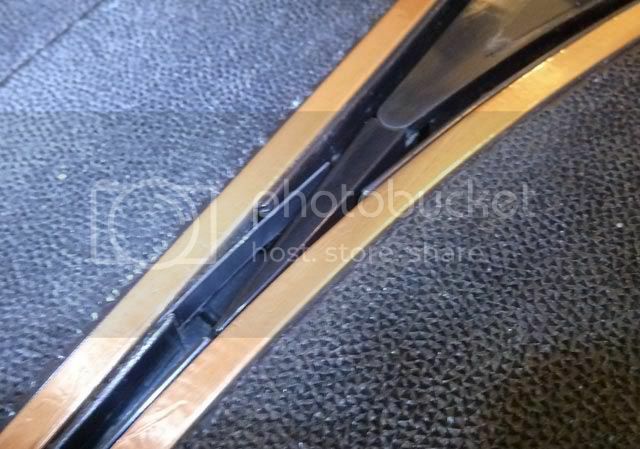 Very simply, a small thin strip of brass is inserted behind the leading edge of the gap between the liner and the rail, and extending just beyond the trailing edge of the gap to create a ramp (this will become clear with the following photos and description). This was a brilliant solution, however, there is some concern about using a conductive metal strip in the slot so close to the rails. 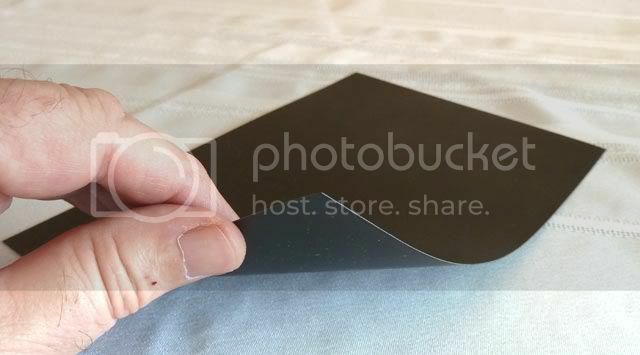 So, Brian at BRS Hobbies located some very thin (0.01" thickness) styrene sheet material that works perfectly and eliminates the possibility of electrical damage should the ramp ever come loose. The following photo shows the ramp cut from a styrene sheet. The dimensions that I use are about 4.5 mm high and 39 mm long. The leading edge is tapered slightly downward so as not to present a sharp corner sticking up from the slot wall to the on-coming guide. The photos below show the ramp installed in the slot. The two black arrows highlight the gap in the slot liner. The edge of the gap depicted by the left black arrow (trailing edge) is where the guide flag can collide with the slot liner. The red arrow shows where the ramp is inserted between the rail and the liner. it is secured in place by a very small dab of CA glue on both sides. I set the trailing edge of the ramp to extend about 8-9 mm beyond the end of the gap. This allows the end of the ramp to be highly flexible, presenting minimum resistance to the passing guide flag. I find that if the overlap is too short then the ramp can seem a little stiff in this area, however, I don't feel that the overlap length has any physical effect on the guide flag as it passes through as long as it extends some distance beyond the end of the gap. The styrene is strong yet very flexible, but not at all malleable, making it perfect for this application. This fix is not necessary for the other gap (leading into the crossover lane) because, when the lane change is activated, centrifugal force acting on the guide flag presses it against the flipper, away from this gap. Quite a bit has been written about methods used to facilitate switching between digital and analog operation of an N-Digital track. Schemes range from the relatively simple, where the digital console is replaced with an analog power base; to the highly complex where external electrical switching circuits and/or N-Digital track section modifications are employed. I will describe the simplest method that there is (along with its limitations) and also provide a tip (a warning, actually) regarding two things that should not be done under any circumstances. So, the simplest method of converting a N-Digital track to analog operation is pictured below. 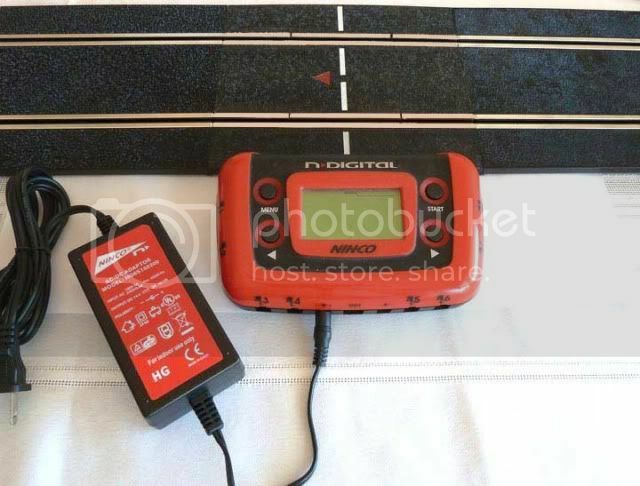 All that is needed is to replace the N-Digital console (half straight) and one additional half straight track section with the standard Ninco power base track. Additionally, if there are any N-Digital Control Towers in the layout, they must be disconnected from their half-straight track section. That section may then be left in the layout. 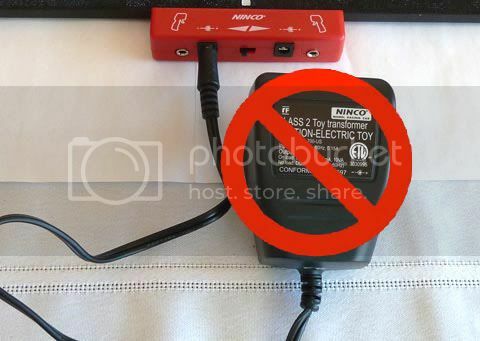 Use the same power source that was being used for N-Digital, either the N-Digital regulated 14 volt 3 amp power transformer (recommended), or a regulated power supply set no higher than 14.5 volts. You can then attach one (and only one) analog controller, such as the Ninco 55 Plus. Why only one? Because by leaving the N-Digital lane change track sections in the layout, what you have is a single lane analog circuit. This is because the rails of both lanes of the LC sections are cross connected internally to help with power/data distribution in digital operation. 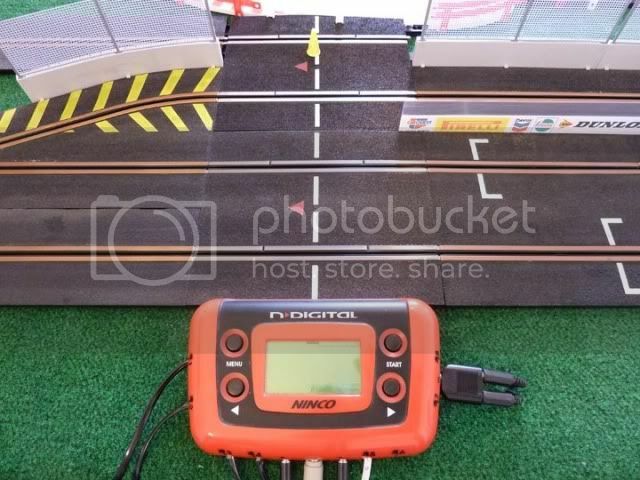 Remember that the N-Digital track is one single lane electrically regardless of how many physical lanes you may have. This happens to be fine for me because it is all that I need. At least for now, I only use analog operation to tune and test cars that I am not ready or willing to convert to digital operation. So running one car at a time suits my purpose. Otherwise, I just prefer digital operation, even when running by myself. Now if you really want that fully independent two lane operation without having to remove the LC sections you can modify the LC's by removing (de-soldering) the internal wires that connect the two lanes' rails together. 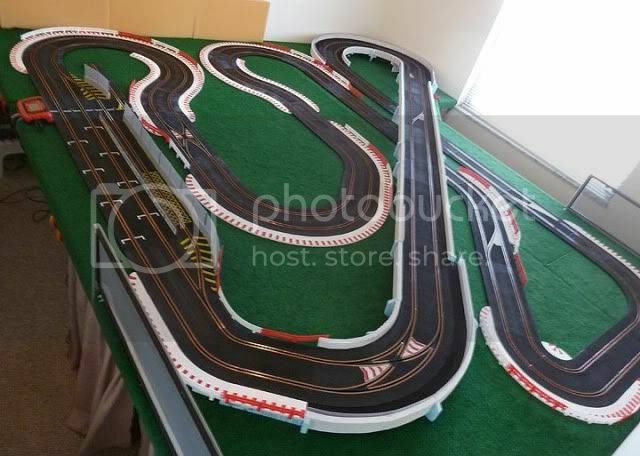 It's a relatively simple, straight forward process, however, that subject is not covered here because it is well documented elsewhere in the slot car forums. Also, I always strive to avoid physical modifications to cars and track that are irreversible or may affect a current warranty. Not always possible, but I try. Suffice it to say that all LC's will require modification, or they will have to be replaced with comparable sections of regular track. 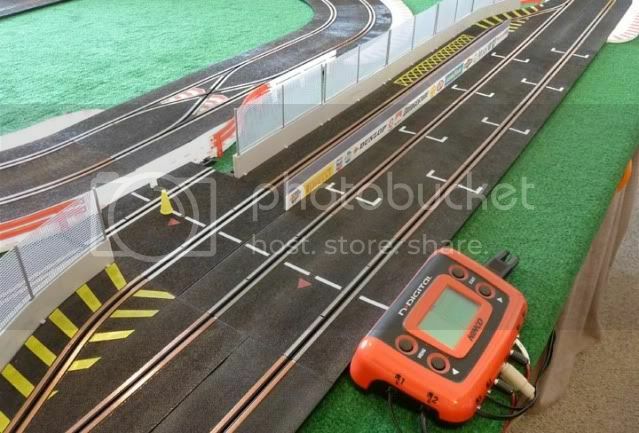 The Pit Lane is a single lane so it can be left in the layout in its stock condition. As previously mentioned, if there are any N-Digital Control Towers in the layout, they must be disconnected from their half-straight track section, leaving that track section in the layout. At this point you can connect a second controller and race two cars independently. 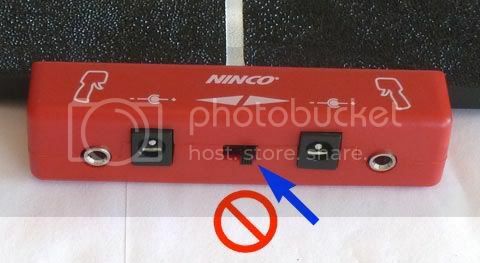 First, do not use the standard unregulated Ninco (or anyone else's) power pack that comes with the analog race sets. If you are using a variable voltage power supply, it must be regulated (switching) and it must not be set higher than 14.5 volts. Failure to heed this warning will result in damaged LC electronics. So, just use the same power source that you were using for N-Digital, set and configured the same way, and you will have no worries. 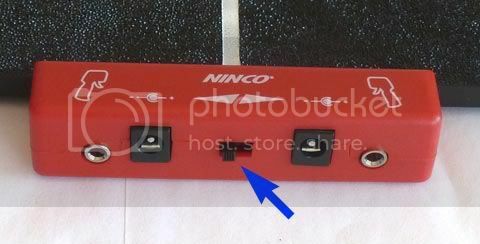 Second, the direction switch on the Ninco power base track should be in the position for clockwise racing direction (see the blue arrow in the photo below). The same as N-Digital. Do not change the direction. The N-Digital track sections all get their power from the rails. As of now, I do not know what the effect of reversing polarity will be on the electronic circuits in the N-Digital track sections. I am not aware of any testing that has been done and for now, I'm not anxious to find out what will happen. It would probably be a good idea to cover the switch with tape or even hot glue (which could be removed later). The information above on switching an N-Digital track between digital and analog operation is available as a Adobe pdf document. PM me if you would like a link to the document. Here are some thoughts on positioning lane change (LC, XLC, XLC curve) track sections in an N-Digital layout. My first rule is to avoid placing a LC track section at the end of a long straight. This is due to the potential of getting stuck on the LC's dead strip when breaking hard while entering the corner – especially when running with a magnet. But looking at the photo of my new layout above, most prominent in the foreground is the XLC curve sitting at the end of the longest straight! It's really a tradeoff that I will address momentarily. Don't connect two or more opposite single or XLC's together (consecutively). You will find your cars changing lanes and then immediately changing back because it's difficult to release the lane change button quickly enough to complete the first lane change while avoiding the second. Remember that changing lanes is not just about overtaking. Every track has an optimal racing line. So, some thought should be given to placing LC's to provide access to the best racing line. For example, I placed a inside-to-outside LC just prior to the only (R1) hairpin turn in my layout so that the gentler radius outside lane could be used when taking the turn. And, regarding that XLC curve section at the end of the long straight? It's in that position to allow 1.) a last second outside-to-inside lane change to get into the correct lane for a pit stop and, 2.) a last second inside-to-outside lane change to avoid someone who is about to exit the pit lane. It's a tradeoff that I have accepted for now. The fact that there is a mild down slope from the overpass helps by providing some extra momentum through the turn. Regardless, I'm dealing with the issue of being at the end of the straight by learning to drive better. Generally, I try to place LC's at the beginning of a straight section for overtaking or right after a turn in more complex sections of the layout. There are no rules so it's important to experiment. If an LC causes problems in one location, try it somewhere else. After all, the LC's are supposed to make racing more fun, not to add stress. There are lots of opinions on this so look at these thoughts as a starting point. 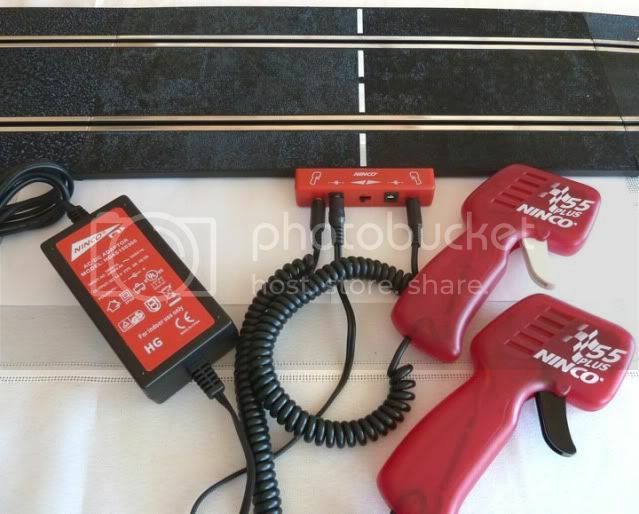 Finally, if you clean/treat your track rails with a solvent-based product such as WD-40 or INOX, here is a simple but effective applicator that will insure that the cleaner will be applied only to the rails and not the plastic part of the track. First, cut the ends off a double-tipped Q-Tip, leaving about one quarter of an inch of the shaft in place for each of the resulting two pieces. Next you will need an old slot car guide that has a reasonably deep guide flag. In this example I used a Ninco standard suspension guide without the spring. The longer shaft of the suspension guide makes the guide easier to hold in this application. The final component is a small to medium insulated alligator clip. Place one Q-Tip end piece on each side of the guide flag held tightly up against the base of the guide. Then use the alligator clip to pinch the remainder of the two Q-Tip shafts together against the guide flag. This will hold the two Q-Tip ends firmly in place. The following two photos show the fully assembled machine. Apply the cleaning fluid to the Q-Tip ends, place the guide flag in the slot, and push the assembly along the slot with mild downward force for about four feet of track length. You will find a coating of the cleaning fluid deposited quite uniformly on the track rails and not on the plastic part of the track itself. Wipe the rails with a clean soft cloth and you are done. When the Q-Tip ends get dirty and ragged just replace them with a new pair. So, this is all fairly simple stuff but hopefully it will be useful to an N-Digital user or two. Perhaps there are some of you out there who have similar, or better, ideas that can make N-Digital racing a little better. Let us know by posting them here. I've stickied it for now, as I think it should be read by any Ninco Digital user. I'd would like you to consider creating an "important threads" message, similar to the one I have started for SSD. In it, you can gather up as many important and useful threads for N-Digital users from all over SCI, be they here in the Digital forum, the Ninco forum, or anywhere else. This very post would be a definite for inclusion. You can edit the original post as needed to add new links, reformat the information, or remove (or note) outdated information. I would then stick that post and unstick this one (since it would be linked in the new post). I like to stay informed on all the digital products out there, but you are clearly one of the most knowledgeable here about N-Digital, and I would really appreciate a "catch all" post of useful thread links by you. Sure. I'll let you know when it's ready. For the lane-changer-slot-liner-gap-stopping-cars-dead problem, my fix was splitting a toothpick in half and taping the resulting half-circular cross section bit of wood just ahead of the end of the exposed end of the liner to deflect the guide. So far it's working OK.
Yeah, do not put lane changers where you might expect to be braking, since rapidly changing the throttle while crossing the dead strip confuses the digital system and can cause stalled cars and lane change flipper misfires. I'm puzzled here - "release"? You don't need to hold the lane change button down through the lane changer to trigger it. I just hit it once momentarily just before the lane changer section and the car changes lanes when it gets there. At least, that's the way I've been doing it - I don't have the manual here to consult. Last edited by bkrownd; 03-16-2012, 06:58 PM. If I release the LC button before the braids contact the dead strip, the flipper does not activate. This with the standard and 'Progressive' N-Digital controllers. The behavior that you describe sounds like a [unique] feature/setting of the Slot.it SCP-1D. Last edited by mfogg; 03-16-2012, 07:57 PM. I have the 'progressive' orange controller. I'll have to try it again next time I put the powerbase in. Last edited by bkrownd; 03-16-2012, 08:42 PM. If you are experiencing problems with the cars, then it is most likely either the track connections and/or the braid to rail connection. 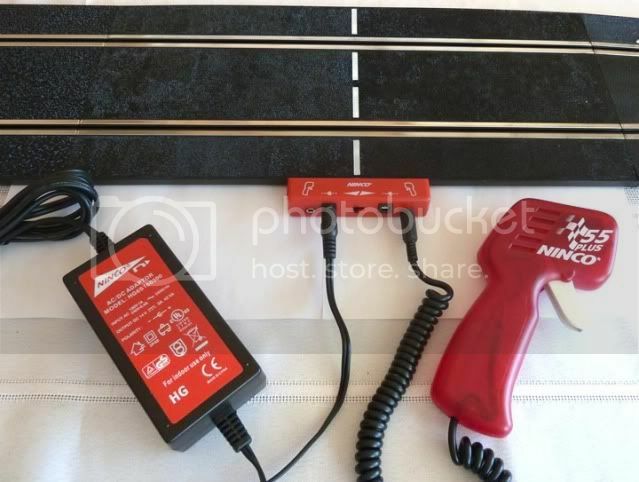 It is important to use NINCO ProRace braid on all your cars and to clean the track rails with INOX M3. Also if it all possible, fit your cars with the NINCO ProRace suspension guide. I have used N-Digital for over three years and no longer have any problems with lane change misfires after implementing the above suggestions. Guess I didn't explain clearly enough the first time. Is it really a "problem", or just a consequence of the design? I should clarify that I'm not saying an unintended lane change is caused when changing throttle across the dead strip - the flipper just blips a little, which is possibly only a mental annoyance to the user. Whether that occasional blip would never ever happen if all the electrical contacts were perfect, I'm not sure. Going over the dead spots the throttle can also behave a bit oddly, since the car can't receiving the information you're trying to give it. It seems like the chip can momentarily become a little confused, but perhaps that's just my impression. As far as loss of braking or acceleration on the dead spots, and the potential for stalling the car on a dead spot, that's simply a consequence of the dead spots being dead. A car can hit up to 3 or 4 dead spots while crossing a lane change section, so ideally you want to be moving at a constant speed to navigate a lane change section smoothly. Last edited by bkrownd; 03-18-2012, 01:46 AM. Mfogg- Really like the new track design and extension on the pit lane. I'm working on my man cave to get a permanent set up and your dedication and knowledge is much appreciated. So glad I switched to n digital, its been great. Last edited by speedy J; 03-31-2012, 02:50 AM. I actually thought about this too, Robert. A single pit lane can be used as either an actual pit lane or a penalty lane to impose a one lap penalty as you describe, but not both -- at least in the same race. As configured in my setup, if you wanted to use the pit lane as a penalty lane in all "non-pit stop" races, you can disconnect the Multi-Lane sensor cable from the console and then crossing the S/F line there will not be recorded. You would then reconnect it for pit stop races, without the penalty capability. If you want the penalty capability in all races, including pit stop races, you would need two pit lanes. One for pit stops and one for penalties. Incidentally, pit stop races are always timed, not number of laps as in "GP" mode. The document that you linked to is the only one that I am aware of. I know that the modification to the lane changers works, however, I cannot vouch for the wiring/switching of the console. You could go ahead with the lane change modifications because they are relatively simple -- just removing the wiring that cross-connects (jumps) the two lanes. Then you would only have to swap the N-Digital console and 1/2 straight track for a full straight analog power base. In the mean time, you could continue to research the console wiring/switching. Last edited by Robert; 06-08-2012, 07:50 PM.